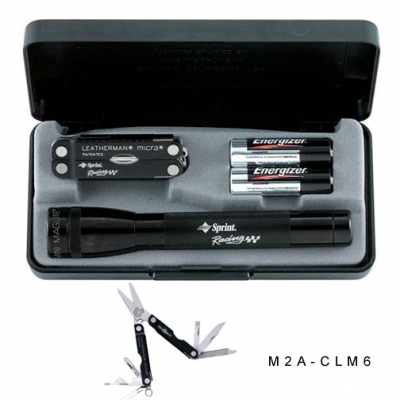 An All-American gift set, a Mag-Lite M2A and a Leatherman, both with your company Logo! Colors of Matching Sets: Available In Red, Black, Blue, Green. Also, a gray MagLite® can be combined with a stainless steel Leatherman tool, which makes an attractive matching set. • M2A Mag-Lite® is available in Black, Blue, Red, Green, Gray, Navy and Pink. Note: For Green, Navy, & Pink M2a Mag-Lite® add $0.65 ea. • Colored LM6 available in Black, Blue, Red, Green, and Stainless Steel. • Price includes laser engraving on both items. Some Mag-Lite® colors are an extra charge. The“AA” Mini Mag-Lite® is paired with the Leatherman® Micra® Tool. The Leatherman® Micra Tool features spring action scissors, knife blade, nail file and much more. All sets come beautifully packaged in a sleek presentation box. A terrific upgrade when your clients are looking for the ultimate personal accessory set. Laser engraved on Maglite (Head or Barrel) and Leatherman Tool.